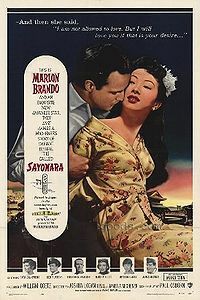 Sayonara is 1957 color (Technicolor) American film. It tells the story of an American Air Force flier who was a fighter "Ace" during the Korean War. The film's screenplay was adapted by Paul Osborn from the novel by James Michener, and the film was produced by William Goetz and directed by Joshua Logan. Unlike most 1950s romantic dramas, Sayonara deals squarely with racism and prejudice.